Equipd integrates with the Clipboard to enable some unique features - and some users are not sure what this means. The clipboard is not actually a part of Equipd - it is a part of the underlying operating system on your device. Windows has a clipboard, Mac has a clipboard, and so does your iPad or iPhone. So what is it? It is an "invisible data buffer", an invisible temporary storage place on your device where you can copy text into it or paste text out of it. It allows you to copy and paste content between programmes on your device. Not just Equipd. So how does Equipd integrate with the clipboard? Equipd allows you to easily copy a scripture you have looked up to your clipboard, without having the manually highlight the text to select it. So if you are typing notes on your device in another app, then you can lookup a scripture in Equipd (eg 2 Tim 3:16,17), press the special "Copy" button in Equipd, and then go back to your notes app and "Paste" the scripture. 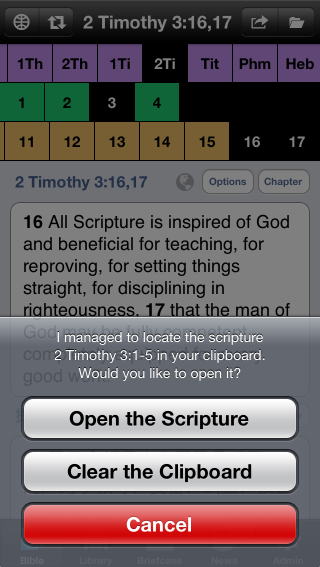 It will paste the verses with the scripture reference - saving you a lot of time when taking notes. For example it will paste into your notes "2 Tim 3:16,17 - All scripture is ....". An unique feature of Equipd is the "Clipboard Scripture Lookup". When see a scripture reference in different app - eg when reading a PDF, EPUB file, or even on a webpage - and you want to lookup the scripture in Equipd, you can just: 1) Highlight the scripture - for eg "2 Tim 3:1-5", 2) "Copy" the reference to the clipboard, and then 3) switch back to Equipd. When Equipd opens it will detect the scripture in the clipboard and ask if you want to look it up - see the screenshot below. Now try it yourself.